I am fed up of my sleeping habits. If i don't sleep, then it is OK. But once i doze off, it's kinda impossible to wake me up. Any kind of alarm clock don't work. Nor the milk/apple/coffee/water or anything else. So, I saw recently this alarm clock. And what an alarm clock it is..?? 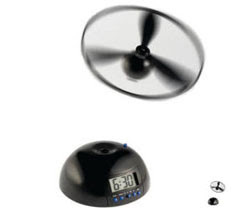 The Flying Alarm Clock wakes you up with a loud shrieking alarm coupled with a little propeller-driven key that leaps off your nightstand. To turn off the horrible racket, I have to get out of bed and retrieve the key. The propeller flies the key high into the air and off into some dusty corner so I have to force my sleep addled brain into wakefulness, move and retrieve the key before the alarm goes off. I think it would help me to wake up. Waiting to have my hands over it..